You will be able to watch and convert your videos like never before. Enjoy Ultra HD videos as they should be. 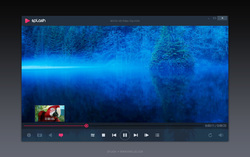 With Splash 2.0 you will be able to watch and convert your videos like never before. Picture2 features will improve your video experience with smooth motion, crisp details and vivid colors. Enjoy the best video quality and unique user experience! A quick comparison with an old version of VLC 1.1.11, I like the interface on this version, and the video looks a little less blocky without any tweaking. Not that there is much control that would enable tweaking, it doesn't even compare with VLC in this department; no contrast, brightness, sharpness, gamma control or synchronisation control. Without these adjustments is hard to see any benefits over VLC particularly for older people where these controls can be very useful. Tested export of an FLV file to an MP4 file and after 5 min nothing had been written to disk, can't think that I'm doing anything wrong to make this happen. To compete with such a superb piece of freeware such as VLC and wanting to charge for it have to be a lot better, in my test it is nowhere near as good. A quick comparison with an old version of VLC 1.1.11, I like the interface on this version, and the video looks a little less blocky without any tweaking. Not that there is much control that would enable tweaking, it doesn't even compare with VLC in this department; no contrast, brightness, sharpness, gamma control or synchronisation control. Without these adjustments is hard to see any benefits over VLC particularly for older people where these controls can be very useful. Tested export of an FLV file to an MP4 file and after 5 min nothing had been written to disk, can't think that I'm doing anything wrong to make this happen. To compete with such a superb piece of freeware such as VLC and wanting to charge for it have to be a lot better, in my test it is nowhere near as good. Downloaded and installed without any problems. Took a quick tour of the software. The software does what the author says it does, the videos I viewed look great. But for the money and only 6 month useage, there are a couple free mediaplayers out there that are better. No need for me to change from the flagship I use already. There are two outstanding players out there that are free. The front runner VLC player, which keeps improving all the time. The other is Pot Player by potplayer.daum.net, the Global Edition. Check these out. Both play on multimedia players just about everything you can throw at them. PotPlayer is an Supports OpenCodec so users can easily add whatever codecs they want. It also supports Direct3D9 Ex Flip Mode and Overlay. It does a whole lot more, just need to visit the site and find out yourself. VLC media player by VideoLan. Plays everything - Files, Discs, Webcams, Devices and Streams. Plays most codecs with no codec packs needed - MPEG-2, MPEG-4, H.264, MKV, WebM, WMV, MP3... Runs on all platforms - Windows, Linux, Mac OS X, Unix, iOS, Android .... Both have 32 and 64 Bit software. They are worth a look. Why pay money for something when the market has superb free software that are no spyware, no ads and no user tracking. Downloaded and installed without any problems. Took a quick tour of the software. The software does what the author says it does, the videos I viewed look great. But for the money and only 6 month useage, there are a couple free mediaplayers out there that are better. No need for me to change from the flagship I use already. There are two outstanding players out there that are free. The front runner VLC player, which keeps improving all the time. The other is Pot Player by potplayer.daum.net, the Global Edition. Check these out. Both play on multimedia players just about everything you can throw at them. PotPlayer is an Supports OpenCodec so users can easily add whatever codecs they want. It also supports Direct3D9 Ex Flip Mode and Overlay. It does a whole lot more, just need to visit the site and find out yourself. VLC media player by VideoLan. Plays everything - Files, Discs, Webcams, Devices and Streams. 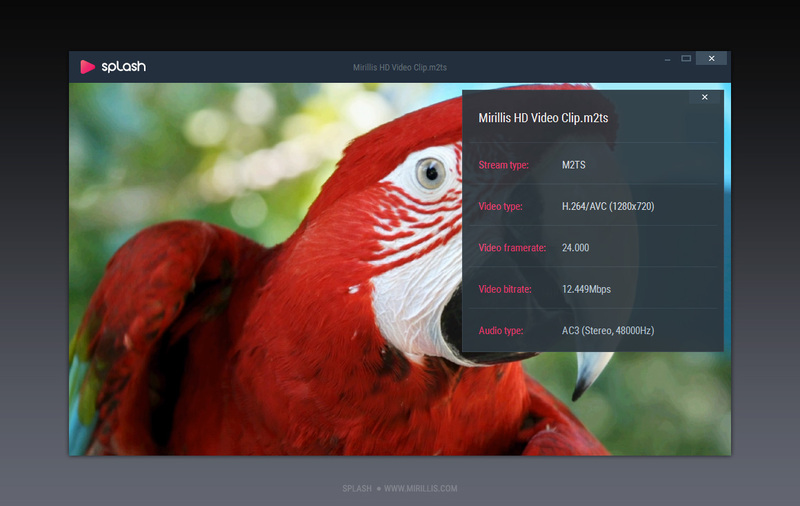 Plays most codecs with no codec packs needed - MPEG-2, MPEG-4, H.264, MKV, WebM, WMV, MP3... Runs on all platforms - Windows, Linux, Mac OS X, Unix, iOS, Android .... Both have 32 and 64 Bit software. They are worth a look. Why pay money for something when the market has superb free software that are no spyware, no ads and no user tracking. Good luck. You can see some comments at videohelp, where users have rated Splash 7.5/10, apparently since 2009. The only quibble [& it's slight] that I have with the ad copy on the Splash product page at mirillis' site is their bit about power saving. If you've got a somewhat powerful graphics card, using it to help decode rather than just display video, I'm not that sure you could count on any energy saving. Now that wouldn't apply to most PCs, since most don't run those sorts of video cards, but when gamers have to run one or sometimes 2 higher wattage power supplies *just* because of those graphics cards, it seems odd to me to think of them as power saving. That's not to make light of mirillis using GPU assist. I'd rather they included OpenCL in the mix of supported tech, but oh well. Would I buy it for $20? Probably not [I haven't so far], but not because Splash isn't worth the money... For Blu-Ray & DVD I have PowerDVD 15 Ultra -- I'll upgrade to the new 16 eventually when it's on sale in the $30 range, because as a licensed Blu-Ray/DVD player it handles those DRM laden discs just like my stand-alone players. 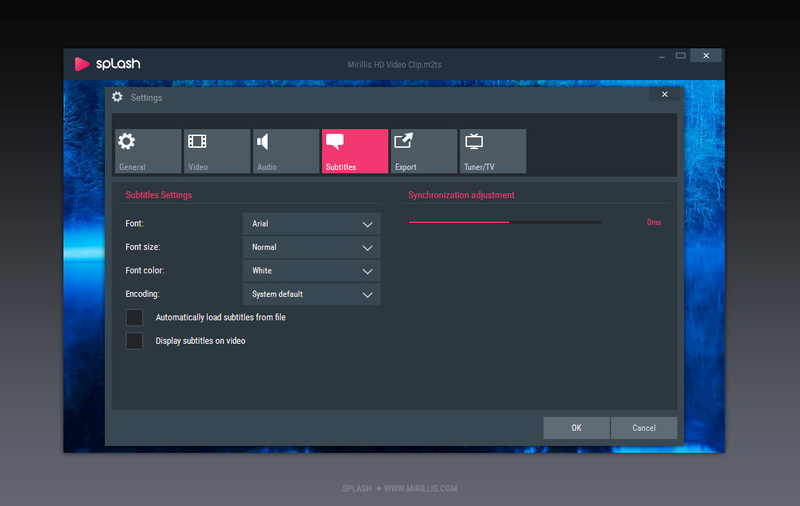 For everything else there are several mplayer-based players [ mplayerhq[. ]hu/design7/projects.html ], MPC-HC [MPC-HomeCinema], & of course the venerable VLC. As downloaded I can't say that any one of them is superior to Splash, but if you spend the time, & get everything working, you *might* be able to use extra Direct Show filters & such to optimize video handling &/or playback for your system, but that's not for everyone & it won't always work the ways you want it to. I like that sort of thing because I can sometimes get both the GPU on my graphics card & the one in my CPU working at the same time, e.g. using ffdshow &/or LAV Filters with certain formats set to use the Intel GPU's quicksync for decoding & the AMD GPU for everything else. I couldn't find anything about anyone using Splash 2 for encoding or converting, though admittedly I only did a few quick searches. With the GOTD from Aiseesoft probably hundreds of millions of people have used ffmpeg-based software, so there aren't many [if any] unknown gotchas. Splash may work well enough, or not, but with all the different types of video out there, I'm not sure someone could count on it to do whatever conversion they need whenever they need it to. Some notes in case they're useful re: yesterday's GOTD & upscaling video... To start with Splash Prem 2 may be a very good player for enlarging video during playback because of it's added filtering capabilities. That's the simplest route. With video the main problems you see enlarging are motion & compression artifacts. When video's encoded it's also almost always compressed, even with so called lossless formats. Video compression generally looks for areas of the same color & brightness, then records something like: for this area use pixels like this one. The more compression you add, the larger those areas can become, & the more they'll compromise, including pixels that are close but not exact matches. This can result in blocky artifacts, which only become more apparent when you make them bigger. With most images you also have a certain amount of noise -- sort of random pixels that can be any color &/or brightness -- and there can be more of this sort of thing when you have colors that just don't work as well with some video formats, especially if/when more compressed. Walls that are [especially darker] shades of beige, especially when shot in lower light [e.g. night] make an excellent test. The problem with video is that this noise is not stable from one frame to the next, so while a still image might look fine, played rapidly in sequence it looks almost like little bugs crawling all over the place. Enlarged, bigger bugs are more noticeable than tiny ones. So to the extent that you have control, try to avoid artifacts by using the highest quality source, e.g. a better grade of camera, & only use higher amounts of video compression on the finished video. When you don't have that sort of control added processing *might* help, but it can also make things worse, plus you have guaranteed quality loss from re-encoding the result. And if you want the best results possible, filter the video in sections when what you see in the frame varies quite a bit, because for example the filter(s) & settings that work best for an outdoor shot might not be so great when the video shows scenes with in-door lighting. VirtualDub has a good selection of filters available, & AviSynth has even more. To increase the size of an image you have to somehow guess the color & brightness of the extra pixels you're adding. There are different algorithms that can be used -- more often you're given a choice between bi-cubic [good for enlarging] or bi-linear [faster & maybe better for reducing], but if you look into AviSynth you can find & use several others. Again however you might find it best to work on sections of the video rather than the whole thing all at once, as the different methods have their own pros & cons. If you do go this route, rather than simply upscaling with whatever player or HDTV, and most all of those will give you the option to display video full screen, regardless it's original frame size, *research, experiment, & test*, taking buzzwords like deinterlace with a grain of salt. Research possible methods you might use [including stuff like frame doubling, interpolation, processing fields separately etc. ], experiment with them singly & combined, performing short tests to see if it was worth it or not [preferably on the same screen you'll use to watch the finished result]. You can see some comments at videohelp, where users have rated Splash 7.5/10, apparently since 2009. videohelp[. ]com/software/Mirillis-Splash The only quibble [& it's slight] that I have with the ad copy on the Splash product page at mirillis' site is their bit about power saving. If you've got a somewhat powerful graphics card, using it to help decode rather than just display video, I'm not that sure you could count on any energy saving. Now that wouldn't apply to most PCs, since most don't run those sorts of video cards, but when gamers have to run one or sometimes 2 higher wattage power supplies *just* because of those graphics cards, it seems odd to me to think of them as power saving. That's not to make light of mirillis using GPU assist. I'd rather they included OpenCL in the mix of supported tech, but oh well. Would I buy it for $20? Probably not [I haven't so far], but not because Splash isn't worth the money... For Blu-Ray & DVD I have PowerDVD 15 Ultra -- I'll upgrade to the new 16 eventually when it's on sale in the $30 range, because as a licensed Blu-Ray/DVD player it handles those DRM laden discs just like my stand-alone players. For everything else there are several mplayer-based players [ mplayerhq[. ]hu/design7/projects.html ], MPC-HC [MPC-HomeCinema], & of course the venerable VLC. As downloaded I can't say that any one of them is superior to Splash, but if you spend the time, & get everything working, you *might* be able to use extra Direct Show filters & such to optimize video handling &/or playback for your system, but that's not for everyone & it won't always work the ways you want it to. I like that sort of thing because I can sometimes get both the GPU on my graphics card & the one in my CPU working at the same time, e.g. using ffdshow &/or LAV Filters with certain formats set to use the Intel GPU's quicksync for decoding & the AMD GPU for everything else. I couldn't find anything about anyone using Splash 2 for encoding or converting, though admittedly I only did a few quick searches. With the GOTD from Aiseesoft probably hundreds of millions of people have used ffmpeg-based software, so there aren't many [if any] unknown gotchas. Splash may work well enough, or not, but with all the different types of video out there, I'm not sure someone could count on it to do whatever conversion they need whenever they need it to. * * * Some notes in case they're useful re: yesterday's GOTD & upscaling video... To start with Splash Prem 2 may be a very good player for enlarging video during playback because of it's added filtering capabilities. That's the simplest route. With video the main problems you see enlarging are motion & compression artifacts. When video's encoded it's also almost always compressed, even with so called lossless formats. Video compression generally looks for areas of the same color & brightness, then records something like: for this area use pixels like this one. The more compression you add, the larger those areas can become, & the more they'll compromise, including pixels that are close but not exact matches. This can result in blocky artifacts, which only become more apparent when you make them bigger. With most images you also have a certain amount of noise -- sort of random pixels that can be any color &/or brightness -- and there can be more of this sort of thing when you have colors that just don't work as well with some video formats, especially if/when more compressed. Walls that are [especially darker] shades of beige, especially when shot in lower light [e.g. night] make an excellent test. The problem with video is that this noise is not stable from one frame to the next, so while a still image might look fine, played rapidly in sequence it looks almost like little bugs crawling all over the place. Enlarged, bigger bugs are more noticeable than tiny ones. So to the extent that you have control, try to avoid artifacts by using the highest quality source, e.g. a better grade of camera, & only use higher amounts of video compression on the finished video. When you don't have that sort of control added processing *might* help, but it can also make things worse, plus you have guaranteed quality loss from re-encoding the result. And if you want the best results possible, filter the video in sections when what you see in the frame varies quite a bit, because for example the filter(s) & settings that work best for an outdoor shot might not be so great when the video shows scenes with in-door lighting. VirtualDub has a good selection of filters available, & AviSynth has even more. To increase the size of an image you have to somehow guess the color & brightness of the extra pixels you're adding. There are different algorithms that can be used -- more often you're given a choice between bi-cubic [good for enlarging] or bi-linear [faster & maybe better for reducing], but if you look into AviSynth you can find & use several others. Again however you might find it best to work on sections of the video rather than the whole thing all at once, as the different methods have their own pros & cons. If you do go this route, rather than simply upscaling with whatever player or HDTV, and most all of those will give you the option to display video full screen, regardless it's original frame size, *research, experiment, & test*, taking buzzwords like deinterlace with a grain of salt. Research possible methods you might use [including stuff like frame doubling, interpolation, processing fields separately etc. ], experiment with them singly & combined, performing short tests to see if it was worth it or not [preferably on the same screen you'll use to watch the finished result].